If you live in Koramangala and/or want to be part of a remarkable political experiment, read on. 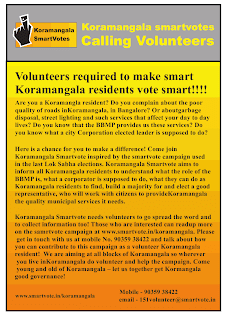 Inspired by the example of Adolf D'Souza's election as an independent citizen councilor, Smartvote is attempting to bubble up a citizen candidate for the upcoming BBMP election in Koramangala. I've explained the process in my post on praja. This movement requires a lot of help in co-ordination and campaigning. Please do reach out to the folks mentioned in the poster if you want to help out.